In this video, Penny shows you how to combine cardio and resistance training to maximize your workout, boost metabolism, and burn some MAJOR calories (fat), all while building strength, speed and endurance. Start slow, do a few practice sets before moving full speeds ahead. Try the modified version (below) before moving into the advance version (above). This way, you don't hurt yourself. Not only that, you'll give your body a chance to build up to these moves. Burpee knee tuck - Just perform a simple burpee. Either jump out or walk out into the plank position. And instead of jumping high and tucking your knees to your chest, just jump upright with hands in the air. Knee tuck squats - Just do a simple squat with a small jump off the ground, land back into a squat or a half squat. Weighted Squats - Just do the squats with lighter weights; or no weights with arms above your head or in front of you. Arnold Press - Just use lighter weights and/or do a regular shoulder press. Advance Plyo Push up - Just do a regular push up on your toes or on your knees. Extra tips: A light, easy jog after an intense workout will do your body good for gradual cool down, to let go lactic acid and release tension. Also, be sure to spend a good 10 minutes stretching after any workout. Look what a little lemon can do! Penny shares the benefits of drinking warm lemon water. To learn more, read the top 10 health benefits below. Now go get your lemons! Many people often love the tarty flavor of lemon juice in their dishes. But have you ever wondered that you can put this lemon juice to many more good uses than this? Yes! There are enormous benefits of lemon juice and water in your everyday life. You simply need to arm yourself with relevant knowledge and you would soon start valuing this amalgamation more than ever. Lemon is an inexpensive, easily available citrus fruit, popular for its culinary and medicinal uses. It is used to prepare a variety of food recipes such as lemon cakes, lemon chicken and beverages like lemonade and lemon-flavored drinks. It is also used for garnishing. Lemon juice consists of about 5% citric acid that gives a tarty taste to lemon. Lemon is a rich source of vitamin C. It also contains vitamins like vitamin B, riboflavin and minerals like calcium, phosphorus, magnesium as well as proteins and carbohydrates. Lemon can help relieve many digestion problems when mixed with hot water. These include nausea, heartburn and parasites. Due to the digestive qualities of lemon juice, symptoms of indigestion such as heartburn, bloating and belching are relieved. 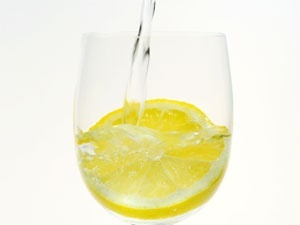 By drinking lemon juice regularly, the bowels are aided in eliminating waste more efficiently. Lemon acts as a blood purifier and as a cleansing agent. The intake of lemon juice can cure constipation. It is even known to help relieve hiccups when consumed as a juice. Lemon juice acts as a liver tonic and helps you digest your food by helping your liver produce more bile. It decreases the amount of phlegm produced by your body. It is also thought to help dissolve gallstones. Lemon, being a natural antiseptic medicine, can participate to cure problems related to skin. Lemon is a vitamin C rich citrus fruit that enhances your beauty, by rejuvenating skin from within and thus bringing a glow on your face. Daily consumption of lemon water can make a huge difference in the appearance of your skin. It acts as an anti-aging remedy and can remove wrinkles and blackheads. Lemon water if applied on the areas of burns can fade the scars. As lemon is a cooling agent, it reduces the burning sensation on the skin. In case you are in good health and weigh 70 kg or less, it is advisable for you to have juice of one-half of the lemon squeezed into one glass of water, twice daily. However, if you weigh more than 70 kg, juice of one whole lemon in a glass of water should be preferred. For maximum benefit, this mixture should also be taken two times a day, though you may dilute more lemon juice according to your taste if you wish. Do not just remain oblivious to the gifts of nature such as this, for you should always try to make the most of them. So, make it a part of your daily routine to drink a glass of warm lemon water in the morning and then open your gateway to enjoy its health benefits.